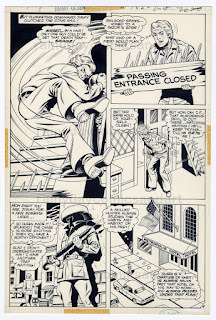 Kleefeld on Comics: On History: Mr. Action! 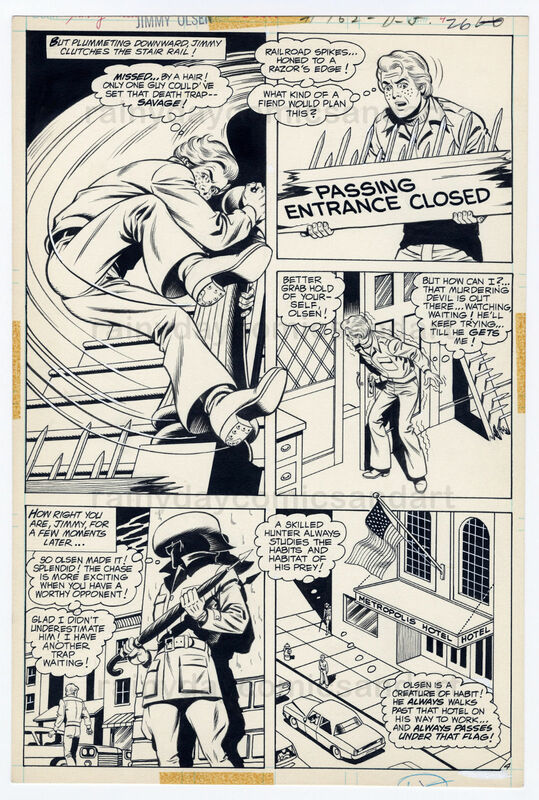 I was poking around on ebay and came across this page of original art from Superman's Pal, Jimmy Olsen #162 by Kurt Schaffenberger. I recognized it immediately as one of the comics I had as a kid. That image of Jimmy swinging away from that bed of spikes was very eye-catching and, although I hadn't actively thought about it in probably thirty years, it was still stuck in my brain. As it turns out, I still actually have that issue. It's coverless now, yellowed and dog-eared. The first page is barely held in place. It's about in as bad a condition as it could be, but still be readable. The story in question is called "The Savage Who Stalked Mr. Action" and it features a big game hunter named Savage who's carrying out a vendetta against Jimmy for busting her illegal fur trading deal. Oh, yeah. "Her." That's part of the big "hook" for the story... this mystery would-be killer is "just a girl" in Jimmy's words. The story isn't particularly good in and of itself, with some overly and unnecessarily complicated traps that Jimmy avoids fairly easily before tricking Savage into one herself, but it does sport the typically wonderful art of Schaffenberger. But here's what caught me most off-guard: Jimmy Olsen is going around solving crimes and calling himself "Mr. Action!" It's played straight, with Jimmy as an adventurer/hero type. Almost like the Robin solo stories that were also being published as Batman backups around the same time. As near as I can tell -- I don't have the entire series and the internet seems awfully vague on this portion of Jimmy's long history -- the Mr. Action stories began in Superman's Pal, Jimmy Olsen #158, and carried over into Superman Family until #167. Generally, the only time the Mr. Action stories are brought up are when someone trots out Jimmy Olsen #159 in which Jimmy dresses up as a woman to evade police. But what makes that notable is largely Schaffenberger's art because he could seemingly not draw an unattractive woman. Meaning that we see a very shapely Jimmy sporting a mini-skirt and tight top that he seems completely comfortable in. Couple that with some blatant sexism permeated throughout the story (Jimmy is discovered because he didn't wear nail polish... because evidently all women wear nail polish and men never do) and it makes for a kind of bizarre tale. Overall, it's a kind of odd take on Jimmy Olsen throughout the series. That he not only has the physical prowess and detective skills almost on par with Batman, but that he also goes out of his way to market himself as "Mr. Action" -- a name that only sounds cool if you're 7 -- seems totally at odds with every other incarnation of the character I've seen. I suppose that's why it's a concept that didn't last very long. Still, there's some wonderful Scaffenberger art that came out of those stories, at least!